The author appears at right in this screen grab from an online video clip. So I joined what turned out to be a very small group going to the march from our diocese – two priests and yours truly. Later we would meet people organized by religious groups of various denominations as well as by labor unions and civil rights groups. Many traveled by bus, a few by plane (including celebrities from Hollywood, and legendary performer Josephine Baker from Paris.) I boarded one of the twenty or so special trains. 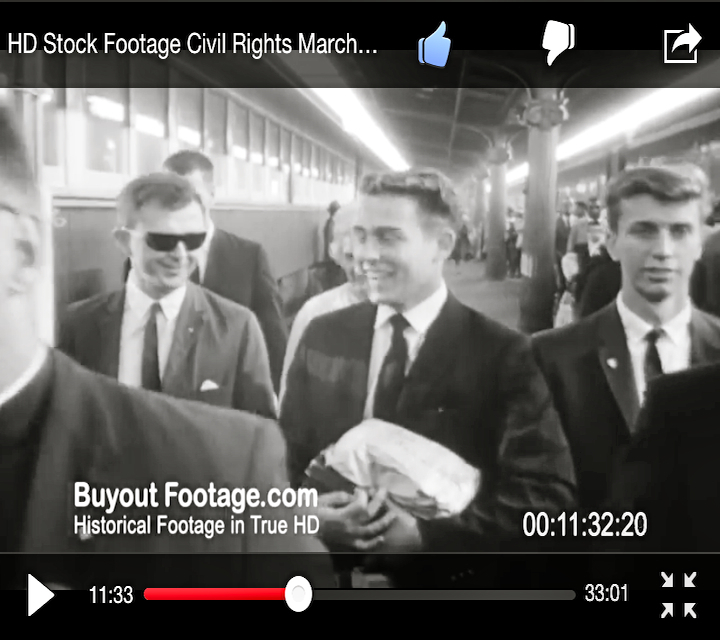 Recently reviewing video from that day posted on YouTube, I was amazed to see a few frames of my 17-year-old self arriving at Washington’s Union Station, walking towards the camera and trying to look appropriately serious, in my dark suit, white shirt and tie. I also looked alert. Vigilance to the possibility of violence was universal that day. From police commissioner Bull Connor unleashing police dogs on demonstrators in Birmingham, Alabama, to the murder of Medgar Evers outside his home in Mississippi, it had been a brutal summer. It’s been estimated that over 14,000 demonstrators across the South (including high school students) were arrested during those months, with at least one death. When I got home I wrote of the “dedicated and dignified fervor” around me at the march. But high spirits were also part of that day’s rhythm. From Union Station to the Lincoln Memorial there was always singing. For me it started even earlier, when I restlessly explored the train on the way down, wandering through one quiet car after another until I suddenly pushed open a heavy door to a car literally packed to the rafters with young people. Some were perched in the luggage racks. Several at the far end of the car were playing guitars, and everyone was singing. The march itself was like one long song. It is more powerful in my memory than the hours of speeches at the reflecting pool. Looking into the faces of the people nearest me, and all of us looking around, my feelings became a reflection of what we felt in common. We were astonished by our numbers, by the fact of us all there, of the reality that was completely new. The overwhelming mood was wonder. It was a sustained altered state, a living dream. We had a sense of unanticipated numbers on the march, but the dimensions of the day weren’t clear until we got to the reflecting pool. So many people (since settled at 250,000, the largest demonstration in U.S. history to that date) and yet the transfixing feeling of peace – I don’t think anyone had foreseen this. I saw the joy and wonder and the tears as black people of different ages and from different parts of the country saw each other there. I was also aware that in this context they could see a young white face undistorted by hate or contempt. We’d marched and sung together, but even as an audience for the program at the Lincoln Memorial, the interactions didn’t stop – interactions that in the mid-1960s were still rare. Now we stood in line together at portable water fountains and toilets. We bunched and sprawled on the grass together, sweating under the same steamy sun, both drowsy and responsive to the inspiring words and music coming through the not always comprehensible fuzz of the sound system. We felt careful courtesy becoming a release into a common regard. We looked at each other. He spoke of a dream that he saw reflected in the waters in front of him. The official intent of the March was to support passage of the Civil Rights bill that President Kennedy sent to Congress a few days after his June speech. Immediately afterwards I recall commentary in the press calling it a failure because that bill was stalled in Congress (it would pass in early 1964.) Today the march is better remembered than the political reason for it. Race has still not been erased as deep separation, nor has full racial justice been achieved. But 50 years after that day, my memories aren’t of politics or even history. They are physical. They are of a future glimpsed by being lived. Bill Kowinski is author of The Malling of America and many articles for periodicals including the New York Times, Rolling Stone and San Francisco Chronicle. He has lived in Arcata since 1996. This entry was posted on Wednesday, August 28th, 2013 at 1:57 pm	and is filed under Opinion, History. You can follow any responses to this entry through the RSS 2.0 feed.